Details about Fiat 128 Haynes Service 1969-1974 Repair Owners Workshop Manual Priced2save BIG! Fiat 128 Haynes Service 1969-1974 Repair Owners Workshop Manual Priced2save BIG! 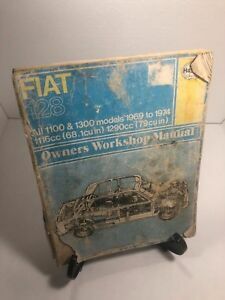 Vehicle Models Covered: All 1100 and 1300 Fiat 128 Models Manual Dimensions: 10.75 x 08.5" x .75"